The LG G Flex2 is the first smartphone we meet that utilizes the latest available Snapdragon 810 chipset. Its processor comprises of four Cortex-A57 cores clocked at 2.0GHz and another four Cortex-A53 cores running at 1.5GHz. All eight cores have 64-bit support and the new ART runtime compiler within Android Lollipop is able to fully utilize their potential. The Snapdragon 810 chip also introduces a new Adreno 430 GPU, which should provide better performance compared to the Adreno 420 accelerator in the Galaxy Note 4's Snapdragon 805. Combined with the 1080p display, it should provide blazing-fast experience compared to any QHD-screen touting flagship. 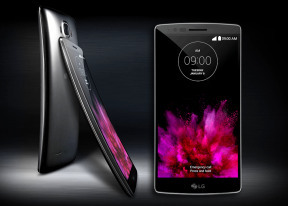 Finally, LG G Flex2 comes with 2GB RAM for the 16GB model and 3GB RAM within the 32GB flavor. LG has been doing this separation since the LG G3 and while we don't approve it, there is nothing we can do. Our review unit is the 16GB variety. Even before we got our LG G Flex2, the news broke that the Snapdragon 810 chip was having issues with overheating and Qualcomm is working on a newer version of the chip. This may have even led Samsung to drop Qualcomm as chip supplier for the upcoming Galaxy S6. Unfortunately, the LG G Flex2 being the first adopter of the S810 hardware, would be a prime example of the new chipset pros and cons. Our impression is that the LG G Flex2 got really warm while running a game, or even a benchmark app, for that matter. We also noticed, that when running benchmarks, its performance dropped after the first run, suggesting there is some sort of CPU performance throttling taking place when the temperature rises. The performance penalty amounted to about 20% and it restored back to normal only after the phone had the chance to cool off. "The devices sampled are representative of final industrial design and user experience but are continuing to undergo additional optimizations to enhance benchmark performance. We expect our upcoming software releases to provide further improvements in this area. We remain confident that the G Flex2 will deliver great experiences to our customers with a tremendous blend of multimedia, performance and industry-leading design." In their response, LG further specified this update should be released in time for the worldwide launch of the phone, so the users won't have to worry about waiting for it. What this means is that they expect to release a software update to change the automatic CPU throttling trigger levels - at least in benchmark scenarios, hopefully making the benchmark results from different runs more consistent. Having all that in mind we proceed with our benchmarks. To speed up the cooling off period we resorted to placing the G Flex2 inside our office in-between the individual runs. All benchmark results listed below were obtained after such cool off period in order to assess the maximum performance of the new chipset and avoid reaching the overeager automatic CPU throttling trigger levels. So, the first test we use is GeekBench 3, which estimates the multi-core performance of the octa-core processor. Apparently, the LG G Flex2 aced our chart, doing a hair better than Meizu MX4's MediaTek MT6595 chip. Back at the G Flex2 unveiling event we also had the chance to do a GeekBench 3 run back then it did even better at about 3,950. Next, we put the LG G Flex2 through the compound AnTuTu test, which gauges not only processor, but graphics and memory performance as well. The new Flex2 did excellent, but not enough to beat the Meizu MX4 Pro and the Lollipop-running Galaxy Note 4. Both of this competitors feature higher resolution displays and slightly lesser chipsets, so this is our first clue LG has to work more to improve the performance. The new BaseMark OS II 2.0 is another compound test, which in addition to CPU, GPU and RAM, calculates web performance and storage speeds. The LG G Flex2 topped our chart doing much better than all other smartphones we've tested so far. Unfortunately, the single and multi-core performance of the new processor isn't the one contributing for the great overall score. The CPU is performing less than expected, probably because LG has trimmed down its performance for a while. The scores are still great, but not as great as all of us expected them to be. LG G Flex2 is the first smartphone to feature the new Adreno 430 GPU. It also comes with a 1080p display instead of a QHD one, which should give it a computing advantage over devices like the LG G3 and Samsung Galaxy Note 4. We ran both offscreen and onscreen tests of the GFX Benchmark, here is how the LG G Flex2 did. Quite expectedly, the Adreno 430 turned out the best GPU we've tested so far and aced both offscreen tests. It is 20% more powerful than the Adreno 420 in the Snapdragon 805 chip and the PowerVR G6450 in the iPhone 6 Plus. You bet the onscreen results turned as impressive as we'd expected them to be. The Adreno 430 is an impressive leader, but part of this lead is due to the fact that competing devices utilize higher QHD resolutions. Oddly, the BaseMark X GPU benchmark put the G Flex2 on the second place, a whisker lesser than the Lollipop-running Galaxy Note 4. Is the Snapdragon 810 chip better than the previous generation? It definitely is, especially its Adreno 430 GPU. Sure, the S810 chip has issues but we expect those to be overcome very soon. Even with throttled down performance, it still does an amazing job and we can't wait to see the S810 in its full glory. The LG G Flex2 is a true flagship, with blazing-fast performance. Under stress, we often found it to heat up in top left corner, but we've never seen it overheat.